Can expert witness testimony help my motorcycle accident case? While expert witnesses aren’t needed in every motorcycle accident case, their testimonies can be extremely valuable in cases in which fault is disputed, or that involve complex technical issues or significant injuries and medical expenses. By describing precisely how the accident occurred and painting a clear picture of events for the judge and jury, expert witnesses can also help motorcycle accident victims overcome the negative impacts of the biases and prejudices they face. If you or a loved one sustained serious injuries in a motorcycle accident caused by another motorist’s negligence behind the wheel, you may be entitled to compensation for a wide range of damages. A knowledgeable personal injury attorney with experience handling motorcycle accident lawsuits can advise you on which expert witnesses might be beneficial to your case. What Is an Expert Witness? 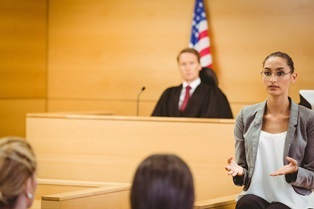 While eyewitnesses testify to what they saw, expert witnesses draw upon specialized knowledge, education, training, proficiency, or experience to provide insight on a particular topic related to the accident. Because these witnesses are considered experts in their fields, their testimonies can carry significant weight with juries. Expert witnesses are particularly helpful in cases where no eyewitnesses were present at the time of the accident. Accident reconstructionists. These expert witnesses examine all of the evidence related to the motorcycle accident—such as photos of the accident scene, the motorcycles and vehicles involved, and measurements of tire skid marks on the road—to determine how an accident occurred and who or what caused it. Accident reconstructionists can be invaluable when it comes to establishing fault. Doctors and other medical professionals. Medical expert witnesses are essential in cases involving catastrophic injuries, as they can testify about how the injuries occurred, the accident victim’s diagnosis and prognosis, and how the injuries affect the victim’s ability to work or care for himself. Testimony from medical experts can help juries determine the value of a motorcycle accident victim’s physical pain and suffering, and counter defense claims that the injuries were pre-existing or less serious than reported. Automotive experts. Sometimes motorcycle accidents can be caused by a faulty or defective motorcycle or vehicle component. In these cases, testimony from an automotive expert can help motorcyclists prove that a manufacturer or mechanic is responsible for an accident. Economists. Determining the value of a motorcycle crash victim’s personal injury claim can be difficult, but economists can help injured motorcyclists estimate accident-related damage such as future medical expenses, lost wages, and lost earning capacity. Vocational or occupational experts. After a motorcycle accident, victims may need extensive time off work to recover—if they’re able to return to work at all. Vocational or occupational experts can testify about how a victim’s injuries will affect his ability to carry out duties in his current profession, or learn and work in a new job. Though eyewitnesses may not have the training and specialized knowledge of expert witnesses, their testimony can still be beneficial if what they saw supports the injured motorcyclist’s version of events. Eyewitnesses can provide valuable insight into weather and road conditions at the scene of the accident, and who struck who and under what circumstances. Do You Need a Motorcycle Accident Attorney? If you were injured in a devastating motorcycle crash, you may need to rely on a financial award from the motorist who caused your accident. However, motorcycle accident victims often face significant challenges when pursing compensation. The award-winning attorneys with McGartland Law Firm can help accident victims obtain testimony from witnesses who are experts in fields relevant to their cases. Contact McGartland Law Firm today to schedule an appointment for a free initial consultation to discuss the details of your case with one of our knowledgeable legal professionals. Can a wrongful death claim be brought against businesses or government agencies? What should I know about DePuy Attune® Knee implant lawsuits? Do I need an attorney if I was injured in a construction accident? Is Xarelto® safe to use?